Previously we have shared same site and many of our users earned hundreds of free recharge by our secret trick. This time all you need to do is simply share your link with your friends and let him download one app. When he downloads and get reward you will get Rs. 100 for that referral. Note: Sometimes you will be redirected to Play Store and sometimes site. If Play Store then download that app and open and if site then simply register. If you are on Android App, then go to register / signup option and fill your details. Now you need to enter the code which you received on your mobile number and confirm it. Now you will find many offers on the sites by which you can earn free mobile recharge. Note: You will see offers only on there Android App, not on site so if you registered on site then download app via this link - http://goo.gl/EdL5ik and signin to your account. 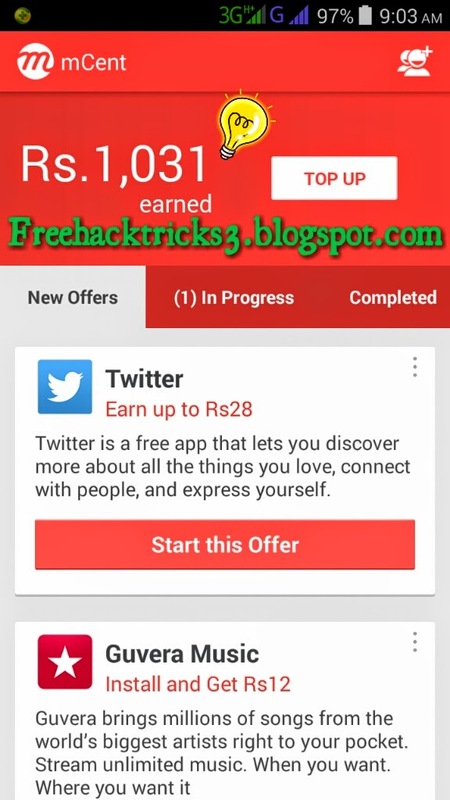 Download apps and earn free recharge. You can also earn by referring your friends. Simply go to "Invite Friends" option and there you will get your own referral link. Copy that link and share on Facebook, Whatsapp, etc and when someone joins the site via your link and do an offer then you will get Rs. 100 per referral. Important Note: After completing offer that is downloading any app open it atleast for 1-2 minutes to get reward instantly. If you didn't get reward for downloading an app, then open Completed offer list and click on that offer which you have completed and click on "Contact Us" and send them mail. You will get your reward within 12 hours.